Blind is this world; here only a few possess insight. Only a few, like birds escaping from a net, go to the realms of bliss. ~ Dhammapada 174. Although the island of Java in Indonesia is the home of the magnificent Borobudur cetiya, Buddhism as a religion had been supplanted by Hinduism and then Islam for several centuries. Chinese immigrants to the country in the early twentieth century practised an amalgam of traditional beliefs and animism. Some educated Chinese were members of the Theosophy Society, thus laying the groundwork for the reintroduction of Buddhism. In 1934, the Sri Lankan dhammaduta monk Ven. Narada visited Borobudur and planted a sapling of the Bodhi Tree. However, the revival of Buddhism and its practice as a distinct religion in the Indonesian archipelago was largely initiated by one man named The Boan An. A local Chinese he studied physics at Groningen in the Netherlands, but in 1953 he ordained as a novice in the Mahayana tradition in a temple in Jakarta. His preceptor recommended that he further his studies in Myanmar and thus in the same year, he entered the famous Sasana Yeiktha in Yangon, to practise satipatthana meditation under Mahasi Sayadaw. In the following year he was ordained as the bhikkhu Jinarakkhita, the first Indonesian bhikkhu in 500 years. In 1955 he returned to Java and energetically worked for the reestablishment of Buddhist temples and monasteries. Largely as a result of his work, Buddhist organizations were formed in many parts of the country. The Buddha Jayanti celebrations in 1956 gave much attention to the fledging missionary efforts of the Buddhists as it was celebrated in a grand scale at Borobudur. In 1959, the two men became the first bhikkhus in the modern history of Indonesia, to be ordained on Indonesian soil. They were named Jinaputta and Jinapiya. Phra Sasana Sobhana of Wat Bovornnives of Bangkok visited Indonesia in 1970 during which he ordained several local men who later formed the nucleus of Indonesia’s indigenous bhikkhu sangha. 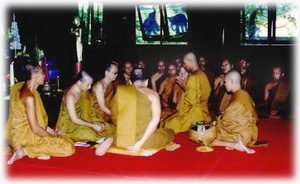 Till this day, as a result of the connection with Wat Bovornives, the Indonesian sangha maintains very close ties with the Dhammayutika sect of Thailand. This decade saw many visits from dhammaduta monks from overseas especially Thailand. Some of them remained in Java and established temples such as the Wat Majhima Sasanavangsa adjoining the historical Chedi Mendut. The meditation master, Ajahn Tate of Wat Hin Mark Peng of N.E.Thailand also visited in 1976. In 1976, the Sangha Theravada Indonesia was constituted headed by Ven.Aggabalo. Presently it is headed by Ven. Sri Pannavaro Mahathera. A young but highly charismatic bhikkhu, he is largely responsible for the tremendous interest in Theravada in the last decade. Through his sermons, which are televised on Indonesian airwaves, a large number of Indonesia’s 200 million population have become familiar with the Theravada form of Buddhism. In 1998, he was awarded the title of Chao Khun by King Bhumibol of Thailand. One of the tangible results of Theravada’s recent popularity was the construction of the magnificent Vihara Jakarta Dhammacakka Jaya in Indonesia’s capital city donated by a local industrialist Bapak Anton Haliman. Today, the Sangha Theravada Indonesia comprises more than 30 bhikkhus ( of both Chinese and Malay ethnic origin ), residing in about 25 viharas mostly on the island of Java. However, there are also viharas on the islands of Sumatra and Bali. The bhikkhus travel widely throughout the Indonesian archipelago to teach. As a result several viharas have also been built on the more remote and distant regions such as the towns of Balikpapan and Banjarmasin on the island of Kalimantan and Manado in Sulawesi. Past editions of Manggala, an Indonesian Buddhist magazine. Photo 1: The beautifil Vihara Samaggi Jaya in Blitar, East Java. 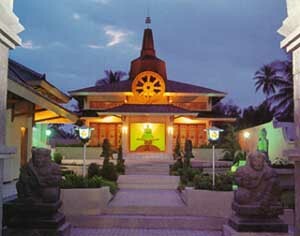 Photo by Vihara Samaggi Jaya. 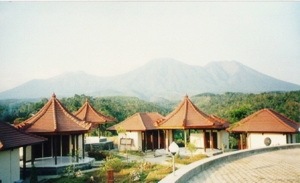 Photo 2: The magnificient Panti Semedhi Balerojo, a meditation center in the mountains in East Java. Photo by Vihara Samaggi Jaya.